Keen Targhee Review: Will These Boots Work For You On The Trail? Will These Boots Work For You On The Trail? This Keen Targhee review takes a close look at the newest iteration of the women's Targhee line of trail footwear. Because Keen has been one of the bedrock trail footwear companies I've used for years and years. And this Targhee Exp Waterproof Mid design has some new features you might be interested in putting to work on the trail. Hiking For Her makes no secret of the high regard in which Keen boots are held after decades of hiking, so it was not surprising when Keen asked for a review of these Targhees. The boots were received free of charge. 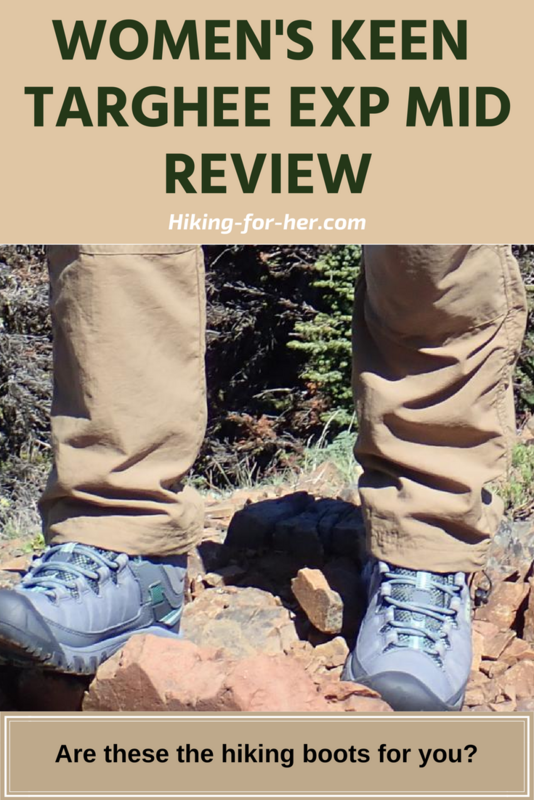 The opinions, comments and photos in this Keen Targhee review belong to Hiking For Her. 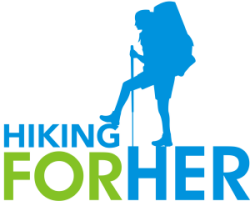 If you purchase a pair of Keens using this link, Hiking For Her will receive a single digit percentage of your purchase price but you pay nothing extra. It helps this website keep humming along, offering trustworthy tips to hikers around the globe. These boots were worn on an 8 mile round trip hike with 2700 feet of elevation gain/loss on established trail, stream crossings, and rocky off trail routes, for a total of 6 hours. These women's Targhee Exp Waterproof Mid boots are available in U.S. sizes 5 - 11. Waterproof, breathable membrane to let your steamy feet vent, yet won't allow water into the interior. I tested the ability of the boot to shed water by standing in a conveniently flowing spring melt stream for around 30 seconds, three times over the course of my hiking day. Arch support via the Keen "metatomical" dual-density EVA footbed, which can be removed (for customization with your own choice), and replaced if worn out. I was tickled pink steel gray/basil when I opened the box and found a pair of beautiful boots nestled within. Look at the ankle support, thick sole, and mud shield on that boot! The first thing I do with a new boot or trail shoe is flip it over and take a long look at the sole. Depth and pattern of tread. That's because I frequently hike on rocky terrain, and I need stable footing and as much grippiness as a boot can dish out. I liked what I saw on this Targhee boot! The lacing system is your chance to customize the fit of your boots. These boots use standard reinforced eyelets plus one hook at the top, making it easy to adjust the tightness across the tops of your feet and your ankle area. Nice touch: The laces are long enough for double knotting, something I recommend as a routine safety hiking habit. But not too long as to require tucking in left overs. These Keens have a nice, roomy toe box. Go up one half size if you plan on only wearing one pair of socks. This advice applies to all Keen boots, not just the Keen Targhee review. If you like the combo of liners with a thicker pair of hiking socks, go up one full size for a roomier toe box and less pressure on the sides of your feet and tops of your toes. Note the polyurethane-coated leather mud shields, which come up over the toe box for durability and an extra bit of foot protection. The coated material also makes it easy to clean the dirt and debris off your boots at the end of your hiking trip. So how do the Keen Targhee boots feel and perform? Ah, now we're getting down to it, aren't we! If you've selected the correct size (see sizing tips above), these boots should feel comfortable from the very first step you take. There will be a bit of stiffness in the ankle area, due to the fact that the boots have been residing in a box for awhile. And perhaps you will need to adjust your laces to put more or less pressure on certain areas, but there should be no blister worries or hot spots created by these boots. A hiker must have rock solid faith in her boots when she's on tricky footing. Like the off trail exploration I did in these Targhees! Happy to report that I felt confident enough to sprint up to the top of this pile of rocks. If you don't hike on stuff like this, these boots may be a tad overbuilt for you. Instead, consider a trail shoe like the lower cut but still supportive Terradora. You have lots of places to spend your money on hiking gear. Here are a few off trail reasons why Keen footwear should be on your go-to list as a hiker. This company is based in Portland, Oregon. Their annual Keen Effect Program disperses grants to grassroots organization working with youth to foster environmental values. You know how happy you feel when you find something that works well for you? And the company that makes it is a breeze to deal with? That's Keen in a nutshell. These boots are seriously lightweight, almost unnoticeable on your feet but with great comfort and gripping ability. Grab your pair of Keens here. Or back up a step (hiking puns, dontcha love 'em?) and learn how to size up a pair of boots before you make your purchase.